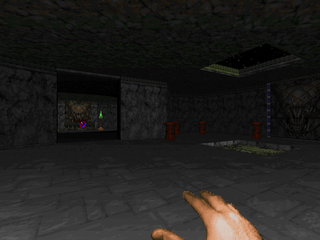 While it's not explicitly known where this happens, Anderson has given Geryon (a MAP08 replacement from id's Master Levels for Doom II) a sense of place quite unique from previous installments of his Inferno series. 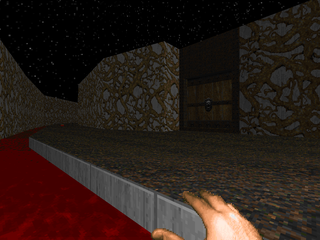 Nowhere is this more evident than the beginning, with the player beginning in a dark cavern with an underground stream emptying out into a river of blood below. The entire sluice is riddled with vines, distinguishing it from Anderson's typical brown metal and green marble predilections. Of course, things change when you enter the base, but the look of the river (and its slight, almost organic curve) distinguish this opening from so many others. The base is of course in Anderson's signature brown mixture of wood, metal and mortar. You can divide it into two halves, western and eastern, with an open-air section bridging the two. There's a toxic cistern to investigate but the more interesting section leads outside, to the structure's outer wall, which has a nice firefight, open though it may be. The eastern section is more of the first with some excellent lighting and sneaky monster placement (and a neat semi-secret green armor). This gives way to a green/gray marble segment, once again helping to break up the theme, before transitioning back to the base theme, leading to two tough fights, including surprise revenants and a baron in a tight spot. 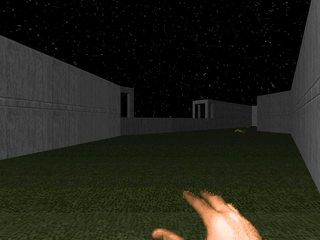 The final moments involve teleporting to two separate encounters. 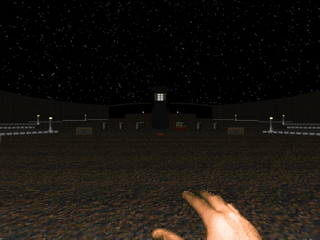 The first isn't much to mention, just a darkened space with lighted center and some easy to dispatch monsters. The other, however, is a large, visually impressive outdoor yard with a circular arrangement, two side-staircases, and a host of monsters for you to fight. It initially caught me by surprise as there are some lurkers I that didn't initially register. There's a final fight to be had but given the weaponry you should collect by the time you reach it you should be more than able to handle it. There's a few traps, of course, mostly of the monster layout variety. Anderson pulls the same trap twice but in vastly different areas; it caught me both times, but it's a goodie. Another one is a crusher trap, which had not previously impressed upon me as standard fare for Anderson's works. Monster layout is good. 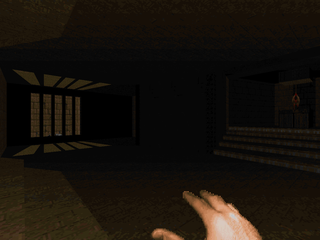 The map isn't choked but bodies are used effectively, especially in spots like the final area, or some spectres in poorly-lit areas. There's also only one key to be had, and it's fairly near its door, too. It all adds up to one of the better maps from Anderson, though in terms of detailing it feels a bit sparse next to Minos' Judgement. Very much worth playing. Just for the record, do you find a random crusher trap a good thing? Personally, I just got crushed when I stepped to push that button, and I logged on here to complain about it. I actually can't even get into the mindset of a mapper who would do that. The ceiling looks the same as any ceiling, no indictation that it will crush you. I went in that room, pushed the button, got crushed to death. Why is this fun? What's the point? Trail and error? Not I can start again knowing that will happen? This is just bad in this reviewer's humble opinion. Just because he's Dr. Sleep and we have heard of him doesn't make him a legend. Just because it was the mid-90s doesn't make this good. I played Doom when it came out, the levels were good. This is bad. This is a bad level, and I actually would've preferred it if I had not wasted time on it. random crusher traps do not bother me. they are so rare nowadays, though, that they catch me completely off-guard, because we are so used to the song and dance of monster closets and teleporter traps. when a crusher trap kills me without warning, it is kind of like a joke, admittedly at my expense, and i can either get mad about it, or laugh at it. I am more of a laugher. I am sorry that you feel that your time was wasted.